The main events will be held at our host hotel, Courtyard Atlanta Executive Park, while side events will be held at The Atlanta Eagle & other locations. 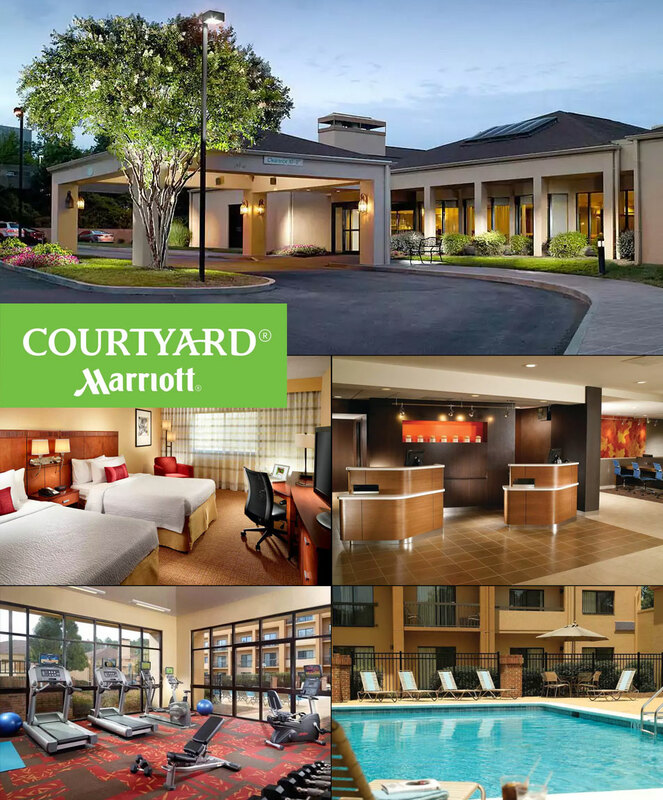 We are proud to continue with Courtyard Atlanta Executive Park, located at 1236 Executive Park Dr NE, Atlanta, GA 30329, as our host hotel. We would like to invite you to stay with us in our host hotel as most of the main events, such as registration, pool parties, meals, open bars, games, shops, VIP Lounge and more, will be held here. The lobby is slated for a total upgrade before ABF'19, yet the hotel has guaranteed to maintain the same pricing we had for years! But in 2020, all of the rooms will be upgraded, so expect a price increase in ABF'20. Reserve your room immediately before the room type you want is sold out. Room is held with major credit card. You won't be charged till you arrive. You can only make hotel reservations with our online booking system (available 24/7). Please do not call the Hotel or Marriott Phone Reservations to make your reservations as they will not be able to assist you. ABF has blacked-out all the rooms during the event dates. Modify the "Check-in" & "Check-out" dates. For example, if you are interested in the full event, change the dates to 7/4/2019 thru 7/7/2019. If you want to book rooms for several days before or after the event at the same reduced price, you can do it directly on the webpage. Just modify the "Check-in" & "Check-out" dates accordingly. If you have any problems, you can call Bruce from BK Travel Agency LLC at (770) 865-3663. All out-of-town guests or anyone with questions should call our in-house travel agent, Bruce from BK Travel Agency LLC at (770) 865-3663 to book air, car, or for extended travel rates and complete itinerary booking if needed. Contact Bruce from BK Travel Agency LLC at (770) 865-3663 to reserve your hotel rooms. Do not book online or call the hotel. Specific rooms have been assigned for our Vendors. Getting from the Atlanta International Airport to our Host Hotel is easy. Take MARTA Rail (Gold Line) from the ATL International Airport to the Lindbergh Center Station. Once you arrive at the Lindbergh Center Station, call the host hotel at (404) 728-0708 and let them know that you are with Atlanta Bear Fest and that you are at the Lindbergh Center MARTA Station. They will send the Courtyard Van to pick you up at no cost to you. The Courtyard Atlanta Executive Park is located north of downtown Atlanta in the Executive Park Business Center. This hotel is in the chic Buckhead area. The new state-of-the-art lobby provides flexibility and choices where guests can work or relax, free Wi-Fi throughout and access to news, weather and airport conditions via our GoBoard. The highlight of our new lobby is The Bistro - Eat. Drink. Connect. Enjoy enhanced food and beverage choices in the morning, dinner service in the evening and The Market, your 24-hour one-stop shop for fresh sandwiches and snacks. Retreat to your stylish, guest room with plush bedding, a flat screen TV and enhanced workspace with complimentary wireless Internet to keep you productive. Our hotel offers two meeting rooms for small business and social events, an updated gym, and an outdoor seasonal pool. If you've reserved your Hotel Room, have you bought your Event Ticket yet? Tip: Get your tickets early as prices go up as time progresses.